Definition at line 27 of file ps_x.h. Definition at line 35 of file ps_x.h. Definition at line 13 of file ps_x.h. Definition at line 19 of file ps_x.h. Definition at line 16 of file ps_x.h. Definition at line 25 of file ps_x.h. Definition at line 33 of file ps_x.h. Definition at line 199 of file ps_x.h. Definition at line 133 of file ps_x.h. Definition at line 111 of file ps_x.h. 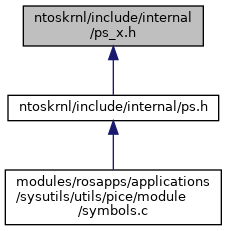 Referenced by PsReferenceEffectiveToken(), and PsReferencePrimaryToken(). Definition at line 177 of file ps_x.h. Referenced by PsDisableImpersonation(), PsImpersonateClient(), PsRestoreImpersonation(), and PsRevertThreadToSelf(). Definition at line 155 of file ps_x.h. Definition at line 62 of file ps_x.h. Referenced by PspCreateProcess(), and PspExitProcess(). Definition at line 40 of file ps_x.h. Referenced by PspCreateThread(), and PspExitThread(). Definition at line 103 of file ps_x.h. Definition at line 84 of file ps_x.h. Referenced by DbgkCreateThread(), and MmLoadSystemImage(). Definition at line 144 of file ps_x.h. Definition at line 122 of file ps_x.h. Definition at line 188 of file ps_x.h. Definition at line 166 of file ps_x.h.